We are blessed at Weddington United Methodist Church with so many different musical groups and talents. Come and join us to praise and pray to our Lord through singing psalms, hymns, spiritual songs, and playing instruments. We welcome you with your passion, enthusiasm, and talents. The Chancel Choir, a SATB choir, leads music every Sunday morning at 11:00 a.m. at the Traditional Service in the Sanctuary. It also sings special services during the year (Advent, Christmas, Lent, and Easter). The Choir rehearses every Wednesday evening from 6:30 to 8:30 p.m. in the Choir Room. We are accepting NEW MEMBERS! Come sing in one of Charlotte’s most exciting choirs! With sacred songs from Bach to Broadway, The Chancel Choir at Weddington will help you find your voice and some great friends! (And if you’re not a church member, that’s not a problem.) To learn more and find out how to join us, watch our video and contact our Music and Arts Director, Dr. Reginald Houze. The Children’s Choir at Weddington United Methodist Church meets weekly on Sunday’s from 9:30 to 10:00 a.m. in The Choir Room. Children’s Choir is open to all children in grades 1-5. Children in grade 6 may participate with prior approval from the conductor. The Choir sings at the 11:00 service on various Sundays throughout the year and two services on Christmas Eve. The season concludes on Palm Sunday. If your children enjoy singing, want to learn more about music, and take their place in leading worship, they should come join the fun! Registration for Fall 2018 is now open. Click here to register your child. The Praise and Worship team serves every Sunday at the 10:10 service in the Family Life Center. A group formed by instrumentalists and singers leads a casual worship service where people gather to meet and praise to our Lord in a unique setting. Acoustic Praise and Worship practices every Thursday evening from 6:00-7:00 p.m. in the Youth Center. If you like a blended musical experience and want to join us, this is your place to serve! The Praise Team serves every Sunday morning at 9:30 a.m. worship Service in the Sanctuary. A band and vocalists enhance the worship experience with contemporary hymns and songs. 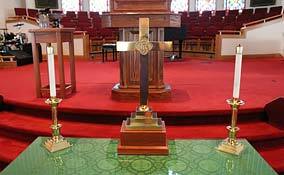 Practice is held every Thursday evening from 6:00-7:00 p.m. in the Sanctuary. If you like Christian contemporary music and want to praise to our Lord with joyful noise and a lot of energy, this is your place to serve! Vocalists and instrumentalists who are interested should contact Justin Lineberry. The WUMC orchestra is formed by passionate volunteer musicians that desire to serve our Lord playing together. WUMC orchestra meets regularly during the year to learn and play new music and grow in faith. It serves at different Sunday services during the year and special services both accompanying choirs and playing solo selections. WUMC orchestra is open to all proficient players of strings, winds, brass and percussion. If you are looking for a group of people that serves our Lord with musical talents and quality music, this is the place for you to serve! If you are tech savvy and interested in using these skills to help our congregration worship on Sundays and throughout the week, this is the place for you to serve!